One dish breakfast meals are prefect for busy weekends, family or friend gatherings, or anytime you want an easy, delicious breakfast! Preheat oven to 350 degrees. Spray an oven safe 9 x 9-inch baking dish with cooking spray, or grease with butter and set aside. Slice bread and cut into cubes. Place bread cubes in baking dish. 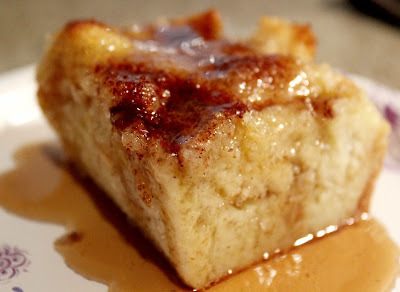 In a mixing bowl, whisk together remaining ingredients and pour over bread cubes in baking dish. Push down on bread cubes some to be sure the are soaked well with egg mixture. 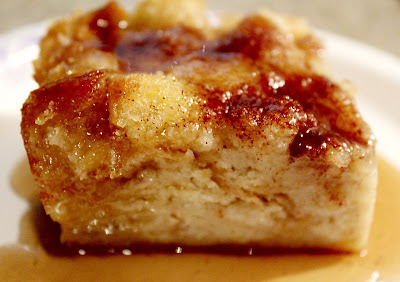 Sprinkle cinnamon sugar topping evenly over top and bake casserole 25-30 minutes or until cooked through. Serve hot with maple syrup! Really decadent topped with some warm Caramel Apple Jam. Notes - Mix it up a day in advance and store in your refrigerator until ready to bake. Bake according to directions above -OR- bake ahead and store in your refrigerator. About an hour before serving, bring to room temperature, then reheat in preheated oven 15-20 minutes or until hot throughout.